Torch Singer is DM's only picture with Claudette Colbert. Combining musical numbers and comedy in an unwed mother drama, it remains very enjoyable today. Sally Trent (Claudette Colbert) arrives at a charity hospital to have her baby. Unwilling to divulge the name of the father, she is lonely and destitute. With the help of another single mother, Dora, (Lyda Roberti) she makes an unsuccessful attempt to raise her daughter, Sally, but eventually returns her to the sisters at the hospital. As Mimi Benton she climbs to fame as a nightclub singer and femme fatale, but when fate intervenes, she becomes the beloved host of a children's radio show, and children's music becomes a center of her life. Back into her life steps Michael Gardner, (DM) her child's wealthy father who has been away in China. Bemoaning his separation from Sally, Michael wants to patch things up but is rebuffed by the hardened "torch singer." Attempting to use the radio show and her status as "Aunt Jenny" to find her daughter, she is ultimately re-united with Michael who has located the now five-year-old Sally. As well as entertaining with song, Torch Singer is touching and amusing, the comedy enlivened by Lyda Roberti's presence. The Polish-born actress lends her broken English in the all too brief role of Dora. Roberti was to die tragically in 1938 of a heart attack at age thirty-one. As Michael, DM's role is not very developed but he has some good moments with Colbert. The final scenes are especially poignant, when the two parents are brought back together because of their love for their beautiful child. It is interesting to see DM play the role of father and his gentleness with his daughter is sweet. 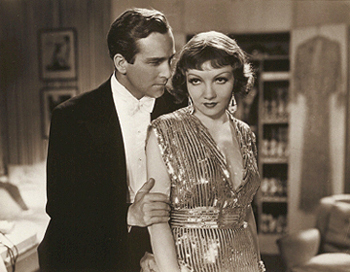 This is the film where Claudette Colbert presented DM with a signed photo inscribed, "To David, from the other end of the comedy team, Claudette" after filming was completed. As he reported many years later, "When we tried to do a scene, we broke up laughing."